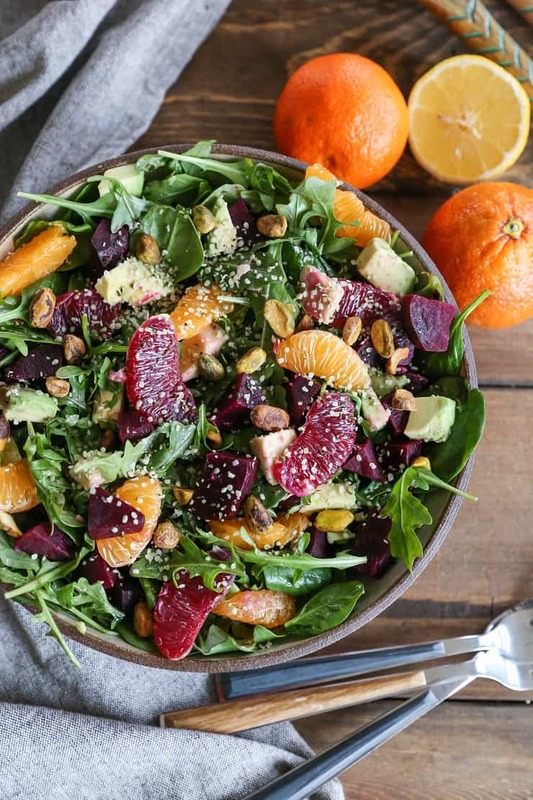 Fresh, vibrant winter roasted beet salad with citrus, pistachios, hemp seeds, and avocado. This vitamin-packed salad will leave you feeling energized and glowy. How has the first month of 2018 been treating you so far? If you’re doing Whole30, how are you feeling? But really. Truthfully, I miss rice. At the beginning of my Whole30, I was so on board with all of the rules and regs because I was feeling like I needed a major re-set, but now that the month is almost over, my mindset has transitioned to that rebellious, “why can’t I eat rice, again?” status. I keep reminding myself this is temporary, but still….why can’t I eat rice, again? Kidding. NOT. I do feel about one hundred billion times better now than I did in December, so I’m keeping that in mind each time I want to face plant into a big bowl of Extra Rice Curry™ (<- Coined term for a ground-breaking recipe I plan on sabotaging the internet with come Feb 1. You think I’m joking, but you know what they say, “Give me Extra Rice Curry and a fulcrum, and I shall move the world…” I’m so happy you people put up with me). Or a batch of chocolate chip cookies. So, if I haven’t been subsisting off of curry and cookies, what have I been eating? WUHL. I’ve been thriving off of soup and salad lately. Soup and roasted vegetables have been my substance food, and salads (either massive and entree-esque or lighter and side dish-esque), have been a nearly daily event. 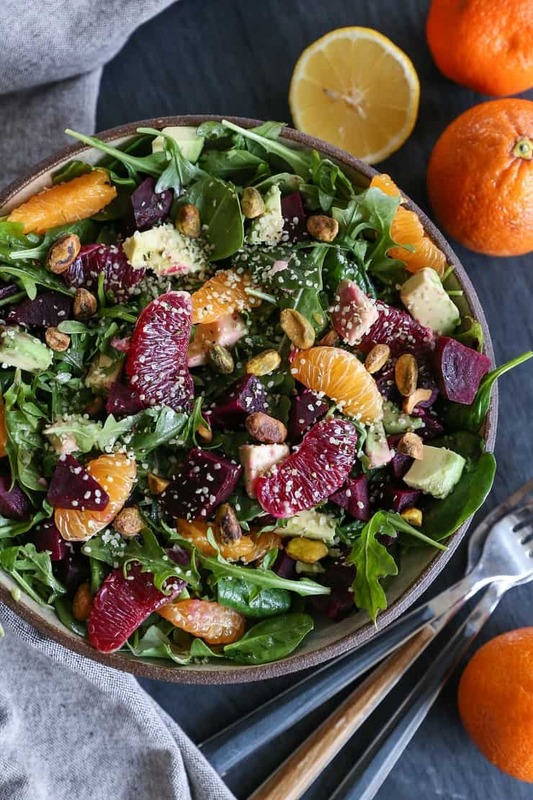 This roasted beet salad is one of those seasonally-appropriate #adulting salads that will fire you up (no joke, I’m convinced beets are an aphrodisiac), and make you feel squeaky clean and glowy. For the citrus portion of this recipe, I use a clementine, a blood orange, and make a dressing with fresh lemon juice. 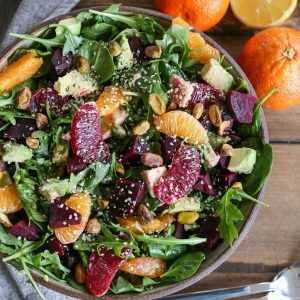 The triple citrus trifecta makes for a super vibrant and perky salad that changes up your lunch and dinner game. If you’re tight on time, you don’t need to peel the outer membrane off of the clementine and blood orange pieces – you can leave the membrane intact. I just peeled the membranes off for visual purposes. There’s a textural difference without the membrane, but my recipes are always a choose-your-own-adventure situation, so don’t go feeling pressured. The combination of roasted beets, citrus fruit, and avocado is a beautiful 3-way produce marriage. After years and years of working with beets, I’ve found you can never go wrong with this combination, as so many flavor and texture bases are covered. Add salad dressing ingredients to a small blender and blend until completely combined (note: if you don't have a small blender, whisk ingredients vigorously in a bowl). Add salad ingredients to a large serving bowl and drizzle desired amount of dressing over the salad. Toss well until everything is coated in dressing. Serve and enjoy. For a sweeter dressing, add 2 teaspoons of pure maple syrup or honey. I’ve never done Whole30 and I’m pretty sure it would be really hard for me. I love my carbs like rice too! That said, I do love salads and soup…there’s always that. 🙂 The citrus-beet-avocado combo is one of my favorites and I can definitely use the clean and glowy feel! This salad looks amazing, colorful and packed with flavor. Can’t wait to try it. This salad looks like just what I need to brighten things up and lift me out of the winter doldrums. So beautiful! I have prepared this recipe twice – once with just red beets and once with both red and golden. Both were excellent. To save time, I used packaged spring green mix lettuces. I have used the citrus reduction dressing on another roasted root vegetable dish and it was great.